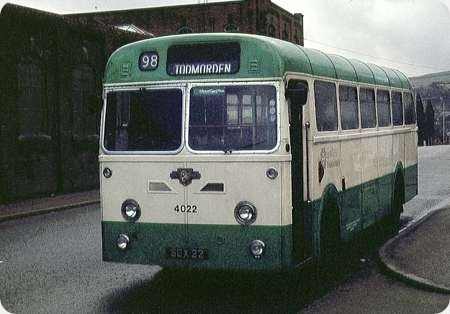 New to Leeds City Transport, 105 (105 LNW) was one of ten (101-110) Daimler Fleetline CRG6’s with Roe H41/29F bodies delivered in late 1964, 101 differing from the rest in having a curved windscreen and having been exhibited at the Commercial Motor Show in the October. Having passed to the Leeds District of the West Yorkshire PTE on 1st April 1974, 101-105 were transferred to the Calderdale District at Halifax in June 1979. The Roe metal-framed bodies on Fleetlines and Atlanteans of this era were to Park Royal design, and many gained a poor reputation for body corrosion and weakness, but these always seemed to me at least to be very solidly built and rattle free, though they had the usual early Fleetline features of heavy steering and unpredictable brakes. 101’s heating and demisting system did not work at all though and during the winter of 1979 it would become freezing cold and was rarely out on the road for more than an hour or so before the windscreen would frost over both outside and in and be rung in for a changeover. It was also very slow and apparently troublesome in other ways and was consequently withdrawn fairly quickly. The other four with their flat fronts were quite decent buses though and carried on a while longer. By February 1981 all but 105 had gone, but it remained, doggedly slogging on and outlasting the others by twenty months before being sold at Central Motor Auctions to Rollinson’s, the Barnsley breaker in September 1982. Here it is seen in 1981 passing through King Cross en route for Cunning Corner. John, Derby Corporation took their first Fleetlines in 1966 with Roe bodies virtually identical to these of Leeds. Now Derby were known for getting long service out of their buses, twenty years was the norm and that included some of the utilities. With the Fleetlines the service life was reduced to fourteen years and some only managed twelve. Like you say, they seemed to be substantially built and I’ve often wondered if there was a change of policy or if there was some inherent weakness which wasn’t readily apparent. Derby’s neighbour, Trent, had some Roe bodied Atlanteans with the squarer type of Roe body as supplied to Hull, Sheffield and some NGT companies and although I liked them, the quality always seemed inferior to the one seen above. Chris, at NGT Percy Main depot (Tynemouth & District the Roe bodied Atlantean’s you refer to were known as ‘flat tops’. Curiously, John, the driving turns I undertook on the 62 route (as it then was in 1964-66) terminated at Rishworth, and I never managed to drive a bus the short distance onward to Cunning Corner or Commons. On the subject of the Roe bodies to Park Royal design, I would suspect that the preparation and treatment of the framing at the Roe factory was somewhat superior to that applied at Park Royal, with consequent benefits in corrosion protection. On a parallel matter, I have just obtained and read my copy of "Steel Wheels and Rubber Tyres, Vol 3" by Geoffrey Hilditch, and his account of life under the West Yorkshire PTE is highly revealing. The reckless profligacy and dearth of cost/revenue management information compares with London Transport at its worst. It would seem that those deemed to be "in charge" proceeded on the principle that the government would not allow its pet PTA/PTE transport policies to fail, so "Spend, spend, spend". Yes, the author’s view might be coloured because GGH himself was not enamoured of the PTE setup, and had been caught up in its entrails by accident rather than design, but the fact remains that West Yorkshire PTE became technically insolvent for some time. Huddersfield JOC purchased a quartet of Roe bodied single deckers in 1961, two on Reliance 2MU2R chassis and two on Leyland Leopard L1, only available at that time with manual gearbox. This was against the run of play for Huddersfield who had standardised on pre select / semi automatic transmission for many years. In fact it was only with the acquisition of Hansons later in the 1960s that a few more manual gearbox buses entered the fleet. I remember journeys home from work on what is a pretty hilly route on one of the Leopard pair where the drivers really struggled with the heavy clutch and ponderous gearchange. 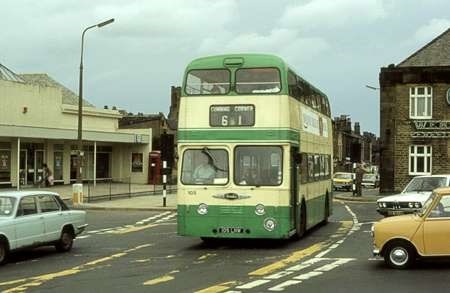 Considering that Sheffield operated a reasonable number of similar buses on equally hilly duties apparently without undue difficulty, it does emphasise the unsuitability of the inclusion of these buses within the Huddersfield fleet. I wonder what inducements Leyland offered to encourage their purchase? By 1974, the bus had become part of the PTE fleet and as an aid to standardisation (both of buses and drivers) I transferred the pair to Todmorden Depot where they joined similar East Lancs and Willowbrook bodied machines. They were only marginally more popular there as Huddersfield had specified an enclosed driver’s cab with access from an offside door rather than the more open aspect of the Todmorden machines but we eked out a few more years service before they could be gracefully retired. The photo is taken outside Todmorden Depot on a typically murky day in January 1977. I refrain from making any comment about the livery! Interesting thought about the livery, Ian! Of course, were the vehicle a few years newer, it might have been called upon to masquerade as a doll and that, I’m sure, would have would have been even more unwelcome in these columns. Ian and Pete, you beat me to it as regards commenting on the colour scheme – I was about to say that at least it could claim to BE a livery and, oh, if only West Yorkshire and the rest of the Country could still be served by such civilised looking vehicles today instead of the notorious and meaningless funereal white, lilac and purple of you know who. Also this bus has another advantage – windows which can be seen out of. I think I recall correctly that these initial PTE colours were "buttermilk and emerald." You must explain the doll! I don’t think that this livery looked all that bad and was fairly traditional. It was all downhill after that. Can anyone confirm that Todmorden (Millwood) bus garage is the oldest in the country in continuous use (since 1907)? Chris I think the green was officially called Verona green When the PTE adopted Metrobus as a fleet name the green was extended to below the windows and the roof changed from green to buttermilk. I seem to remember reading somewhere that the purchase of these two vehicles with manual gearboxes was a ‘mistake’. Around the same time Huddersfield had bought Titans with semi-automatic transmission and perhaps thought the Leopards would be similarly equipped. The later PSU Leopards were of course offered with semi-automatic transmission as an option to manual. I can come up with at least a couple of London garages with longer lives than Todmorden, Geoff. HL (Hanwell) Garage has been continuously open since 1901, originally being a London United tram depot, then an LT trolleybus, then bus garage. WH (West Ham) Garage has been continuously open since 1905, originally being West Ham Corp’n’s tram depot, then an LT trolleybus, then bus garage. I know there is the wellknown tale of Western SMT buying some Daimler halfcab coaches assuming they would have Gardner engines only to find they arrived as CVD6’s, then when Daimler refused to swap them they sold them off straight away, but otherwise I must say that I find it very difficult to imagine that a major operator could buy something by mistake – particularly in the case of a municipality. I have somewhere deep in my collection some tender documents for new halfcab chassis and bodies drawn up by Salford City Transport for consideration by prospective bidders in the 1960’s. Their required specification went into the most minute detail, and must have taken their Chief Engineer a considerable amount of time and effort to produce, as well as giving the bodybuilders in particular quite a headache working out how to modify their standard model in order to comply and win the bid. Chris – yes, but I really meant to say "in continuous use by buses". Those you mention started life as tram depots. Millwood was of course used by buses from the outset as Todmorden never had trams. I was referring to the Worst Bus "Barbie" livery. On some former Yorkshire Rider vehicles which came to Southampton, this supposed livery was on vinyl sheets, rather than painted on. The answer may indeed lie in London here are two not former tram depots. Chelverton Road, Putney opened in 1888 with Horse buses and must have been one of the first,still open operated by Go Ahead London. Cricklewood, opened 1898 with horse buses and was the LGOCs first motor bus garage, still open operated by Metroline.